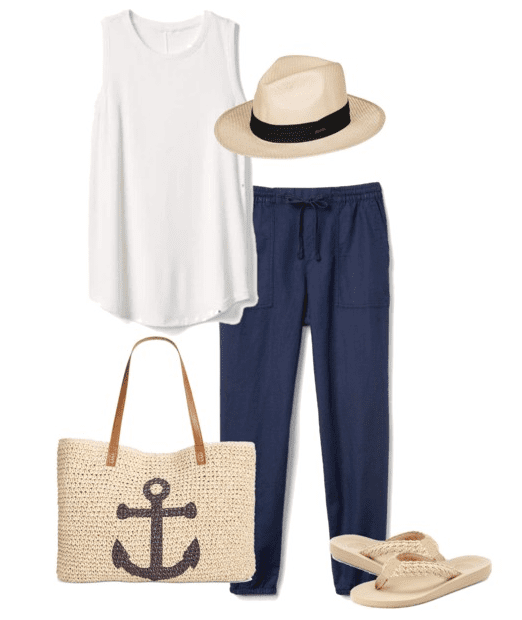 Are you looking for outfit ideas for the beach that don’t involve a swimsuit? These four ideas will help you feel good about what you’re wearing, so you can focus on having fun. Is it possible to enjoy the beach without wearing a swimsuit? Yes, yes it is. 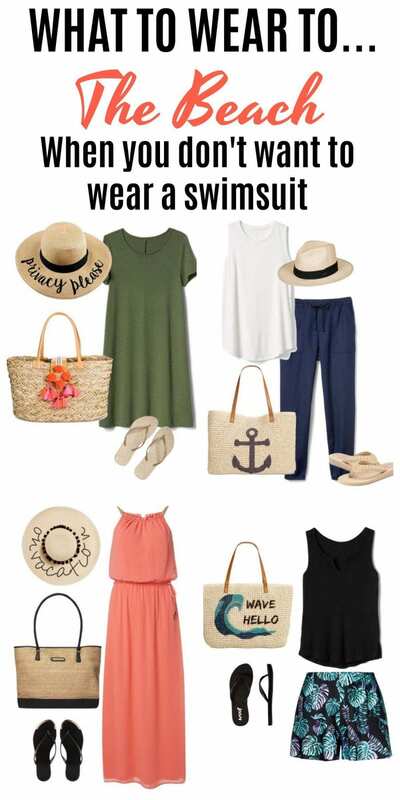 After I wrote the post 5 Outfit Ideas for Women Who Hate Wearing Shorts, I had a few of you ask for outfit ideas for women who hate wearing swimsuits. Most women have a love/hate relationship with swimsuits and I get it. I’m right there with you. As hard as I try to embrace my body as is, there are situations or months or just moments where I have absolutely no desire to wear a swimsuit, but I still want to be comfortable and enjoy the beach with my family. There are a few go-to outfit formulas I use when this is the case. Here are some swimsuit alternatives for a fun day at the beach. When in doubt, put on your favorite maxi dress and flip flops. The lighter the weight of fabric your dress is, the better. If you decide to wade in the water, just hike up your dress a bit or tie a knot at the bottom and enjoy cooling off. Do your legs need some sun? Put on a comfortable, lightweight t-shirt dress and soak up some of the sun’s rays. I love t-shirt dresses in general for summer, but they’re also perfect for the beach. You can wear it as a swimsuit cover-up or alone. Another option it to wear it with a pair of leggings. Have you embraced the joggers trend? I didn’t appreciate them until I got my first pair. Then I understood what the hype was all about. They are so incredibly comfortable and stylish. The ones pictured above are a cotton-linen blend and perfect for a trip to the beach. I’d even wear this outfit while seeing the sights and sounds of a new city. If you despise wearing denim to the beach as much as I do, forget the denim shorts and go for a loose fitting pair of printed shorts. Not only are they super comfy, but they’ll dry fast if they get wet. 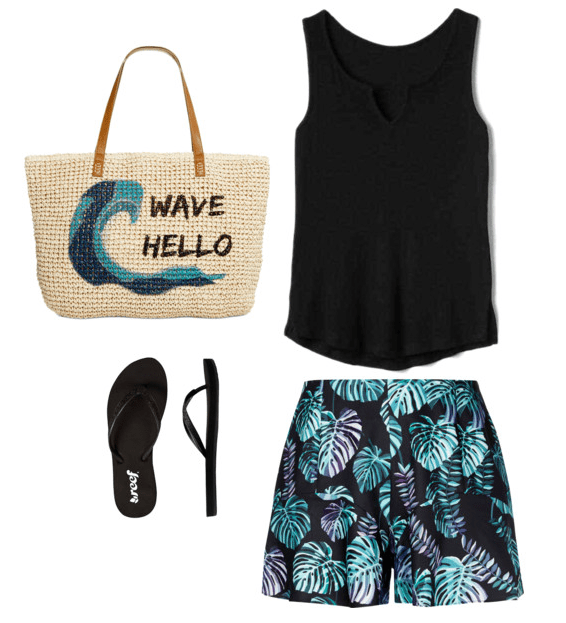 Pair your shorts with a tank and flip flops for the perfect day at the beach. I hope these no swimsuit outfit ideas for the beach gave you some inspiration for what to wear. Now go out and enjoy the sun, sand, and water! I love all these outfit ideas!! Especially the joggers!